This is a quickie post for those of you who won’t be reading my workshop description (in which these pictures also appear). Among my favorite sources of color inspiration are embroidered clothing and tapestries from historic times. 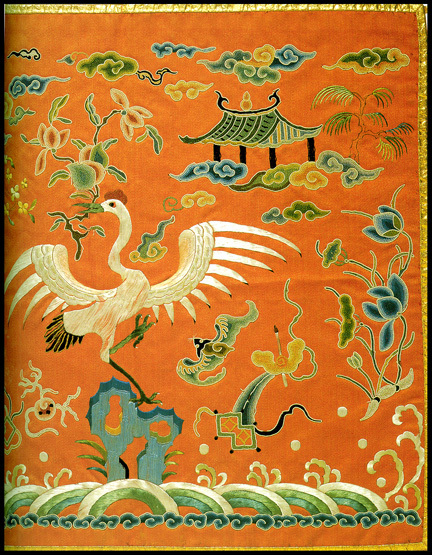 The above color combination was inspired by images in an exceptionally beautiful book titled “Silken Threads: A History of Embroidery in China, Korea, Japan and Vietnam” by Young Yang Chung. The book is worth buying for eye candy alone but the text is interesting and extremely readable as well. This is the main image I used as a color reference. I didn’t intend it, but somehow elements of the stitchery crept into my cane design as well. I do sometimes incorporate the designs from embroidered work into my canes because the simplified imagery is readily translatable into cane components. In this case, however, it was unintentional. Below, you can see some of the different pendant veneers I made from the cane. 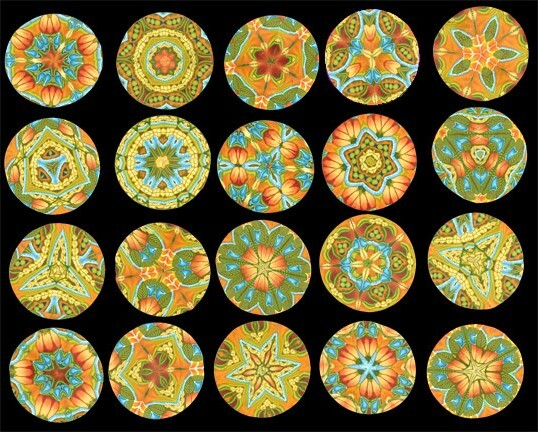 The image is a scan of the actual clay veneers before I applied them to pre-formed pendant cores. When I made the necklace at the top and bottom of this post I purposely chose cording that looked somewhat ancient and interspersed large knots between the beads in an effort to achieve an ancient Asian look. The back side of the necklace is shown below. I just came across this image of earrings and decided to add it at the end of this post. The only thing I can think to say is “AMAZING” !!!! Carol your work is amazing. After listening to your presentation and learning about your scientific approach I’m even more moved by the beauty of your art. Awesome! Can’t wait for the class! Neither can I! There are only 2 spots left. Carol, I love your work and I am always inspired but it. You are one of the best cane ladies I know. Keep up the good work and thanks so much for sharing. Polymer folks are the best!!! It’s nice to hear from you. Thanks so much for your support. Getting a glimpse of your work is always a delight. Your colours are inspirational and your canes exquisite. I saw these beads at the Bead and Button show. They are so amazingly beautiful in person. Stunning work. Thank you. I’m glad you got to see them! The B&B pictures were pretty bad, especially the calendar one. I’ve never been to the show but hope to make it someday. Carol, I’m impressed by how much variation you get from one cane. Beautiful work, you’re my hero. I am building 20 lb blocks of colored clay and generating 50-60 large (14-16″) pieces but I’m looking for ways to create more variety from my blocks. I’m going to try making a triangular block as you do. So far I’ve just made square ones which is a more common practice among colored clay ceramic artists. I’m interested in creating images of fish, turtles, etc. but I don’t want to get trapped in “one block-one image”. Did you get away from representational work like your desert series so that you could play more with changing patterns? Thank you Dean! The reason I switched to triangles is that I’m constructing kaleidoscope designs and circular kaleidoscope designs are basically mirrored and repeated triangles. I had less waste if I started with a triangular cane. Someday I hope to get back to the deserts.